This phrase is from the August issue of the Shunju Calligraphy Society's assignment workbook. The phrase is for the beginning of the Autumn season, and would be a beautiful phrase to put into a scroll. Rough Translation is, "To hear the Falling Leaves At Your Hometown". 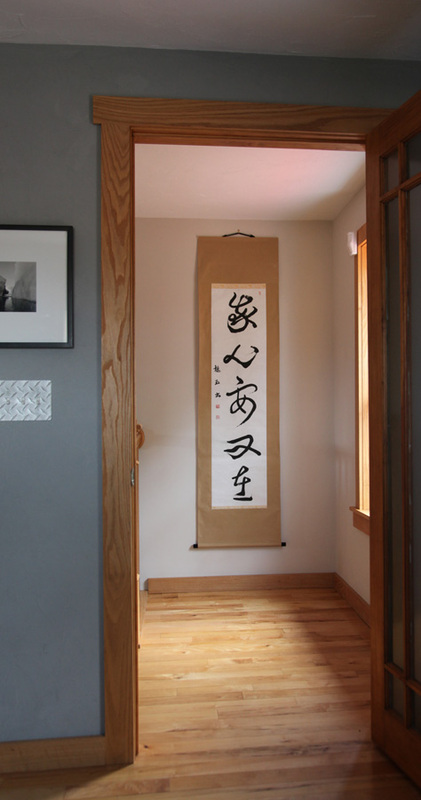 This hanging scroll (掛け軸Kakejiku) was made as a gift for a martial artist. It is going as a set with a hand-made 剖検 Bouken, which is the wooden training sword used for martial arts training. The taupe cloth provides a sense of the natural world. 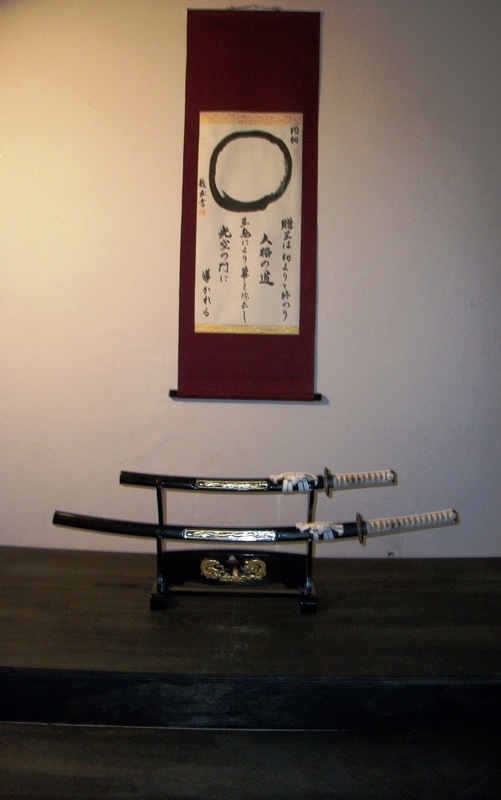 The red ichimonji was selected to remind the practitioner of swordsmanship that the sword can draw blood. Care should be taken to use it for self-defense purposes only. The black lacquered wood jikusaki is a perfect complement to this scroll. This scroll is written in the Gyousho style by 龍玉Ryugyoku. Some individuals have looked on keywords specifically for styles of writing. One way to tell if a piece is written in the semi-cursive style is that the character is still legible, but strokes will be connected by tapered, faint lines. This scroll was made for a Martial Artist from the State of Washington. This dojo has always been very supportive of my work and has ordered several scrolls. It makes me feel good when I receive multiple orders from the same customer, as it is confirmation that the customer is pleased with the end product. This is the translation of the first name Shaylee. In Hiragana we translated it to the phonetic spelling of しえり　Shi e ri. 士 is the same character as that written in Bushido or warrior, it has the meaning of acolyte. 恵 is the character that can read e, but is often Megumi and means to be blessed. 里 is the character for Ri or Sato and is your parents hometown village. The translation we gave is the Warrior of the Blessed hometown. Both characters Megumi and Ri are commonly used in Japanese girl’s names. The customer chose the beautiful purple rose cloth, which is now sold out. They requested a beautiful gold ichimonji for the border. To provide a strong accent, a much wider 14 bun top and 9 bun bottom was selected for the size. This is written in the Kaisho, block print style by Ryugyoku. This scroll was submitted in which her writing was deemed of quality to become the Shihan Rank in her calligraphy society. This scroll is not for sale. 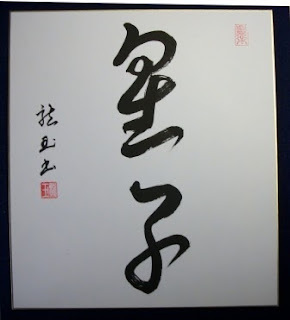 This is written in a mixed style called Gyousou which utilizes both Semi and Full-cursive styles. This phrase is a stanza of a longer poem, and reads as follows. In the valley, the fragrance of the orchards wafts in the air, and crimson clouds gather. During the light rainfall, the beautiful birds come resting on the new green branches, which have awaited the return of their nimble visitors. This was written in March preparatory to submission for the test submission in April. This evokes images of springtime in Japan. It would be a wonderful scroll to use for a bonsai display that utilizes an early springtime theme. The scroll is very long, about 10 feet in length, and my wife's first comment was that the Ten was too long. However, because a kakejiku is traditionally viewed from a seza kneeling position, I wanted to create a scroll that would be balanced and focus on the writing, following a more traditional design format. I am very appreciative of the time and effort my wife expends on perfecting her writing. This scroll is my gift to her. I let her choose every aspect of the kireji, jikusaki, and kake/makihimo. The cloth has a green leaf pattern which is used for the viewer to have the image of the birds resting on the green branches. I had a red jikusaki to symbolize the crimson clouds, but Yoshimi opted for the black with gold band, which is a new addition to the inventory. The kakehimo is a white with Blue/Green speckle and was used to set it apart from the Shirocha (gold) that I normally use. This scroll took over three months start to finish, but has given me a great satisfaction upon completion. This customer wanted a kakejiku 掛け軸that would take a haiku俳句 created in English and translated into Japanese. To get the proper translation it was difficult to follow the 5-7-5 On criteria. However, to capture the true meaning of the poem, we felt it was important to utilize a rule called jiamari 字余りto provide for accurate meaning of the poem. 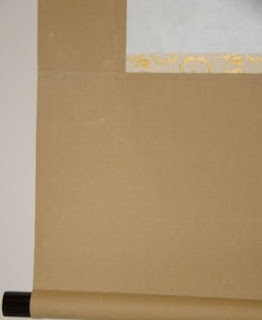 The scroll is made with a taupe cloth in the Maru Hyougu 丸表具style. I used the gold clouds on red-orange to correlate the above haiku with another Japanese expression. 女心は秋の空 Onnagokoro wa Aki no Sora. This phrase means a woman’s mind changes as quickly as the Autumn sky (at sunset).This captures the essence of the fleeting nature of love. 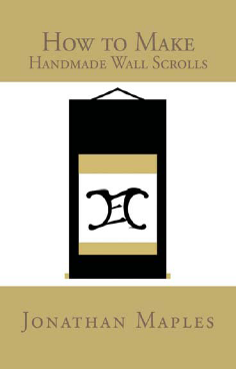 The scroll is accented with a beautiful Black lacquer Jikusaki with a gold band painted around the end. The customer also ordered a beautiful Fuchin that complements the Kireji color of the wallscroll. The moving bamboo rustles by the blowing of the refreshing wind. This is a phrase for the beginning of the summer season. Our feelings become invigorated when we visualize this type of refreshing landscape. 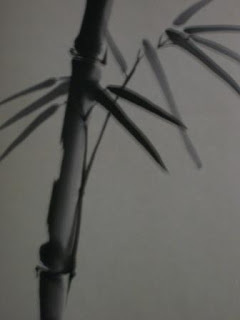 Shuuchiku means a bamboo that has grown long. Master Takuan said that this phrase is continued to then be written in reverse order as 脩竹動清風. The question of this phrase is whether the bamboo is moved by the wind, or is the bamboo moving making the wind. The separation of the cause and effect cannot be ascertained with the natural eye, but is only revealed to us through the profound diversity of the natural world. When the wind picks up enough to cause the greenery to rustle, this is called Seiseishii wind. As this type of wind blows the same feelings are tightened up within the self and cause an inner rustling like the bamboo. Furthermore, this makes one face former feelings. Translated by Jonathan Maples from Page 326 of the Zengo Kichigo Jiten published by the Japanese Calligraphy Society. This 掛け軸 kakejiku is a reflection of my feeling in life right now. The Yin Yang is seen as a symbol of opposites providing balance by integrating the differing ideas and feelings. The artist who drew this for me was able to take the idea and express it in the brushwork. For example, the characters are outfacing each other because if switched to face inwards, the two objects would repel and push away from each other. The opposing forces do not fit congruently. Additionally, one is drawn superior and one inferior. At all times one of the forces in nature is dominant. The blue cloth is accented with swirling patterns to represent the dizzying relationships we must endure and can be tiring if looked or dealt with for long periods of time. The red Ichimonji provides a sense of ire, or anger at the world that is bottled up inside. The scroll is 2.18 feet in length and very wide at 1.59 feet when compared to the length. This scroll is completed in the Maru Hyougu style and more detailed dimensions are listed below. If you would like to order a custom scroll there are three ways to get started: 1. Go to my shopping site at www.shop.customjapanesecalligraphy.com 2. Download my scroll design workbook from my website at www.customjapanesecalligraphy.com to read about the concepts behind kakejiku or wallscroll design. 3. 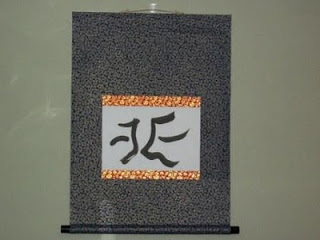 E-mail to me directly at sales@customjapanesecalligraphy.com This scroll was made from a bamboo sumi-e painting that was made over 10 years ago. It was drawn by Yoshimi Maples. This is done in the Maru hyougu style, but you will notice that the cloth used as the brocade borders the entire work. There is a 1 bun gold border between the Hashira and the Shihon. The cloth color chosen is a khaki color. This is a very traditional cloth selection for a Japanese scroll. You may be asking yourself, why I have tried to imitate a Japanese style design for the scroll. It is because many American bonsai artists have complained about the following on my works. B. My cloth selections would not be appropriate for a formal Keido style Toko no Ma display. Sometimes one does something to prove a point. That is this case. I have created a scroll to prove that I can make a Kakejiku in the traditional style. Usually I make pieces for my own joy, but in this case I am trying to satisfy other individual’s desires for what they want in a scroll. 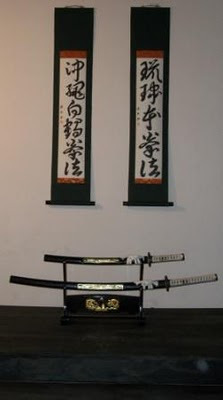 In a similar situation with the Martial Art's market, I did not get many sales until I started adopting traditional phrases such as the seven virtues of the Bushido, peace or harmony etc. I hope that the people will recognize that I am flexible enough to create a wallscroll that will fit their individual needs. You will notice that the work has not Urauchi backing and there may be slight wrinkling in the future. The Ensou Circle or Enso is the ideal of emptiness in Zen Buddhism. Meditation exercises are a common discipline used to train acolyte priests to reach this state of emptiness. How does one empty the mind to not be worried with outside worldly trappings? Can inward solace be achieved in this fast paced, critical world? One reason that I decided to start this business was because making the scrolls to gain this peace. Framing the artwork takes time, concentration and creativity when working on the design. I hope that those same feelings and emotions are conveyed to the viewer of the artwork. There are some that have told me that the Enso circle should start at the top. I do not know the technical reasons, nor do I know if this is actually a true or factual statement. I have seen many different artists begin the brushstroke at different areas. Some begin at the top and some at the bottom. Regardless, it takes a significant amount of practice and discipline to develop the skill necessary to draw a beautiful circle. Ryugyoku has shown that skill. I chose the white cloth to give a light mood to a sometimes somber artwork. It is not the case for all people, but often when I reflect internally, the mood can be somewhat subdued for me. So I wanted a white cloth to help make the scroll more bright and cheery. The leaf pattern in the cloth provides me with a sense of being in nature. This scroll is for sale at $55.00 plus $15.00 for shipping, handling and taxes. This character phrase means "concentrating with a single heart by utilizing one's will". This is a phrase for martial arts which reminds that concentration and a single will are required to accomplish individual goals and desires. This has been true for me in my personal struggle as a business owner, trying to get people to see the vision of my works and to spread my vision of the world both wide and far. It takes tenacity and drive to get others to believe in your vision. It also requires one to possess both patience and wisdom to see a project to the end. That is why I continue to work on scroll making every day. Every problem that is encountered provides me with new insight on how to fix a problem or repair it to improve the process on future works. Dedication of the heart requires both concentration and a will to see the journey until the final step. I wanted to make this scroll with the dragon scale cloth. When I think of the word dragon the first word that comes to mind is tenacity, and embodied all of the principles of Ichii Senshin. This is written in a Gyousho style by Ryugyoku. This handmade scroll comes with a certificate of authenticity and is for sale at $75.00 inclusive of all taxes and shipping in the US. If you would like a different scroll made to specification please contact sales@customjapanesecalligraphy.com. I follow traditional methods and techniques that I learned from my Sensei in Japan to make each scroll as individual as you are. There are many sites that offer computer generated translation of names into Japanese or Chinese characters. What happens is it spits out characters that will phonetically match the desired name. Custom Japanese Calligraphy believes it takes more thought and care for the translation of a name. For example, recently we had an order for the name Jacob. You are an intelligent warrior whose mighty rule brings success to all his people. This is a fine translation if you are a martial artist or polititian, but this was for a less than 1 year old baby. As a result, we decided to use the bible phonetic spelling of Jacob, which is Yakobu. This gave us characters more suited to the sitution. There are competitors that use tricky tactics to maintain their top page rankings in Google...For example, I know at least three sites that use Custom Japanese Calligraphy Scroll in their keyword phrases. I find that funny...Is a single person such a threat, that they feel they need to use another's company name in their keywords? I am proud of my work and will gladly explain the differences of scrolls. In fact one competitor in particular says they create Custom Japanese Scrolls. Yet they utilize a clearly Chinese Hanging String and it is hung with the makihimo on the outside of the scroll. This is never the way a Japanese scroll is hung. There are many excellent calligraphers in the US, but my wife submits on a monthly basis her works to a Japanese Calligraphy Society. We let the old garde in Japan judge her works, and they have found her writing sufficient to be warranted as a Shihan Kaku. A variety of styles are practiced every day, Kaisho, Sousho and Gyousho as well as kana, which is a style native only to Japan. This scroll was ordered from Greece. Asunaro is an idiomatic expression in Japanese which means, "Tomorrow, let's become Cypress Trees". Kai is a group, organization or meeting. Cypress tree wood is valued tremendously. This scroll was made for an Iaido (Katana) school in Greece, but it would also work for a Bonsai club as well. The deep green of the kireji very much brings about the forest feel in standing under the trees you see in Japan. The red ichimonji just seems to make the scroll be very beautiful and large and accentuates the beauty of the Kaisho, block print style written by Ryugyoku. This scroll was commissioned as a gift. It reads 詩宗 Shisou with the name David St. John, as the names appear in the Japanese Bible written in katakana on the left hand column. Shisou means master poet. This is a gift for a prominently published modern poet, David St. John. You can read about him at the following link. http://www.poets.org/poet.php/prmPID/149 The third left hand line bears my wife's calligraphy signature name Ryugyoku and her Hanko. What stands out most about this scoll, is the use of black cloth. Athough not common, it is not unheard of. The ichimonji selected has a very large karakusa pattern, and is a gold on creamy white. I make this extra large for several reasons, but primarily to give good spacing between the Honshi and the Kireji. I not only enjoyed making this scroll, but got introduced to some good poetry in the process, which is always educational and inspires me to become better. This scroll was designed by a person interested in the Martial Art called Tenshin Shouden Katori Shintou Ryuu. (天真正 伝香取神道流). This martial art is one of the oldest extant Japanese bujutsu systems, and was founded by Iizasa Chouisai Ienao 飯篠 長威斉 家直who was born in the Chiba prefecture area of Japan in 1387 A.D. This style of Martial Art is historically recognized as being founded in 1480 A.D. The story of the transmittal of this martial art was from the deity of the Katori Shrine in Sawara, Japan. It is said that after 1,000 days of continuous daily and nightly practice, the deity of the Katori Shrine Futsunushi no Mikoto (経津主之命) visited Iizasa in a dream and transmitted to him this martial art strategy in a scroll called the Muroku Heihou no Shinsho. This particular martial art has been designated as an “Intangible Cultural Asset” from the Japanese government. 3. I will never engage in any kind of gambling nor frequent disreputable places. 4. I will not cross swords with any followers of other martial traditions without authorization. I hereby pledge to firmly adhere to each of the above articles. Should I break any of these articles I will submit to the punishment of the Great Deity of Katori and the Great Deity Marishiten. Herewith I solemnly swear and affix my blood seal to this oath to these Great Deities. To learn more about this martial art please go to this link for the Wikipedia site. 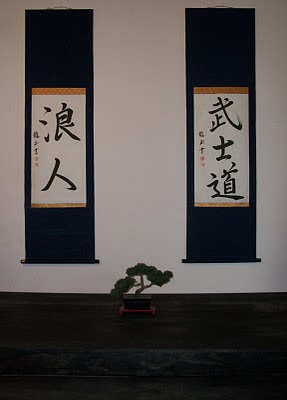 The scroll is a saying of Iizasa Soke, which reads Heihou Ha Heihou Nari. In English this means, “The Art of War is the Art of Peace”. Art could also be written as Way, and alternatively means, “The Way of War, is the Way of Peace”. 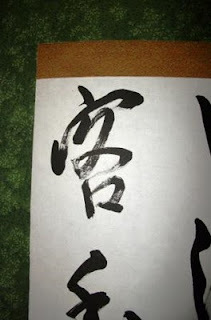 This beautiful phrase is written in a semi-cursive style called Gyousho by Ryugyoku. 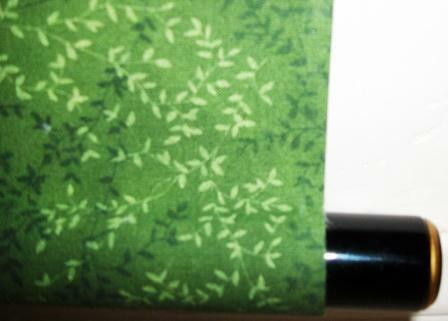 The chuumawashi is a green silk with a taupe Ten and Chi. The scroll was made in the Sandan Hyougu (Three Step) style. The Red Ichimonji was used to symbolize the Keppan or blood oath. 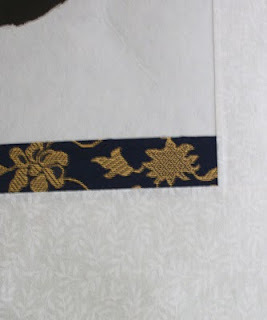 In this case the brocade not only borders the top and bottom of the work, but also there is 2 分 bun border on the right and left hand sides of the 紙本 Shihon or artwork. Obedience to the Keppan are all encompassing in the life of the Katori Shintou Ryuu practitioner hence, it encompasses the entire work. The scroll is completed with a beautiful wood jikusaki that is lacquered red. Making this scroll was both a challenge and very inspirational in being diligent to the end. I don't think I even have to explain these pics....Customer's words..."Thank you! They are awesome!" I have to say THANK YOU RYUGYOKU AND REN for your beautiful work. You asked for it and now you can get it. Have you ever wondered how they create the beautiful wallscrolls called kakejiku with cloth and paper in Japan. Here is your chance to learn. This newly published book shows the entire process of how to make your very own custom kakejiku. With pictures, graphs and simple to read text instructions, you too can learn how to make these scrolls by hand using tradtional Japanese techniques. 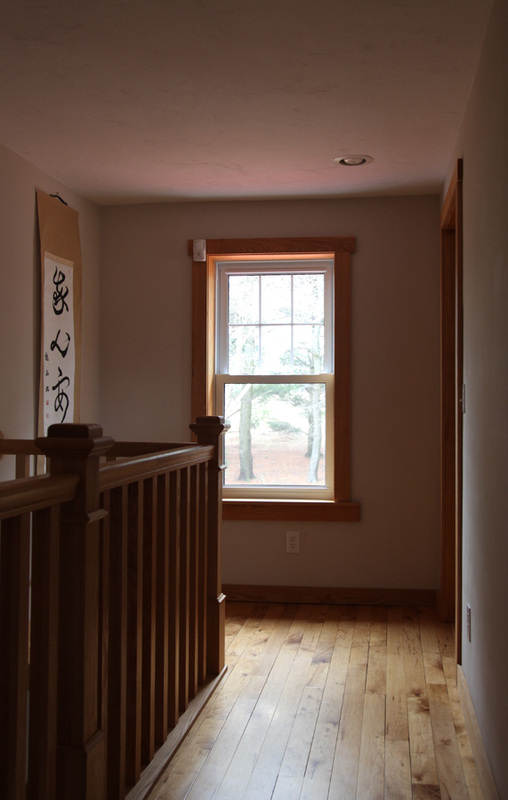 You can frame art prints, photographs, Japanese calligraphy or sumie into these scrolls. Providing beautiful decor for the home or office. This book was a labor of love and took many months to prepare, edit and get ready for publication. The book is now available online. Book ISBN number is 978-1-4500-6755-3. 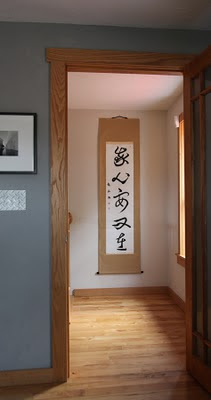 Go to http://www.shop.customjapanesecalligraphy.com/ to order online. 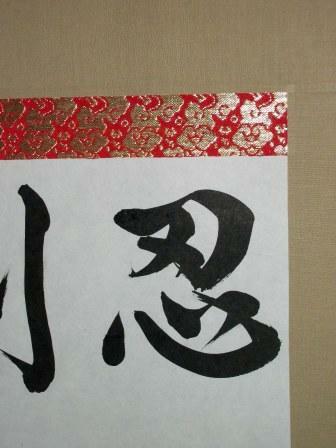 You may also e-mail directly to me at sales@customjapanesecalligraphy.com to obtain additional information. This beautiful scroll was ordered from Canada as a graduation gift. The first thing one recognizes looking at the picture is there is no brocade, or ichimonji cloth bordering the artwork. This is because it is a Fukuro Hyougu style scroll. This is the primary difference between the Maru Hyougu kakemono. Because this scroll utilized a light Khaki colored cloth, I inserted Suji onto the scroll. The three black lines are all 0.5 Bun in diameter. It is also capped with beautifully black lacquered wood jikusaki which really harmonizes the colors of the suji. As mentioned above, this scroll is for an individual who graduated in Social Work/Counseling. We did not know where this will hang in a future office, but the neutral colors along with the good contrast of colors will allow it to hang almost anywhere. The writing was done by my Shihan Calligrapher wife, Ryugyoku in the Kaisho style. The customer asked for balance and courage as the words for the scroll. These words are read as 平衡 Heikou and 勇気 Yuuki. It is a strong reminder for future counseling recipients to have balance and courage to overcome their afflictions. This custom piece was ordered from the Ozawa Cup tournament. It is a beautiful Hanshi scroll written in Kaisho style. The words beginning from the top right to bottom right and then top left to bottom left is Spirit 霊、Peace 和、and Discipline 鍛錬. The thing that I liked most about the scroll, is that although the hashira were quite narrow, about 10 bun, it seemed to bring out the bold strong strokes of the Calligraphy. Late in entering this, but this is the third scroll in the series. Okay, I am sorry, but I feel that the translation is personal for this dojo, so if you can read Japanese great, you will know what is written if not...please become a member of this dojo to find out. I really enjoyed working on this project. Although I am sure the customer is disappointed in the time frame it took to complete. It was necessary to be very thorough in the process to make the scrolls per the customers specifications. Look for more posts next week. This is a scroll for a dojo in the US. They are using the writing as a meditative practice for practitioners to contemplate what they have learned and put them in a higher plane of thinking. The dragon was drawn once again by my talented artist that I rely on, Ren Adams.This is written in a gyousho style, and if you compare the Panther with this one, there should be some obvious similarities. This is in the Maru Hyougu style and is on a taupe cloth. The decision on the cloth was very difficult. Some swatches of different fabrics was sent so they could not only compare it to the wall onto which it would hang, but also how the cloth would look with the entire design was necessary. This was a very difficult and complicated project, but was very satisfying. This is a scroll for a dojo in the US. They are using the writing as a meditative practice for practitioners to contemplate what they have learned and put them in a higher plane of thinking. 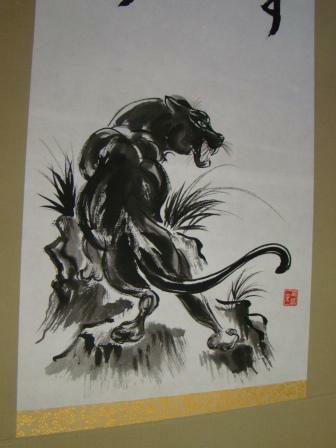 The artwork of the panther was difficult to do as traditionally, Japanese and Chinese brush painting does not have a history of using panthers as subject material. Thankfully, one of the wonderfully talented artists I rely on, Ren Adams, used Tiger's, which is a common theme in Sumi-e. You can see how beautifully she transitioned subject material. I will also say how beautifully well done the writing is on the scroll in a gyousho style, because it was done by my wife, Ryugyoku. I post this picture with written permission of Mr. Hilvers, Curator of the Bonsai Collection at the Clark Center for Japanese Art & Culture. I would also like to thank the Clark Center for hosting me this weekend. This was my display that I was able to do with the help of the Southern Utah Bonsai Club and Mr. Jim Greaves, who graciously provided the beautiful suiseki. 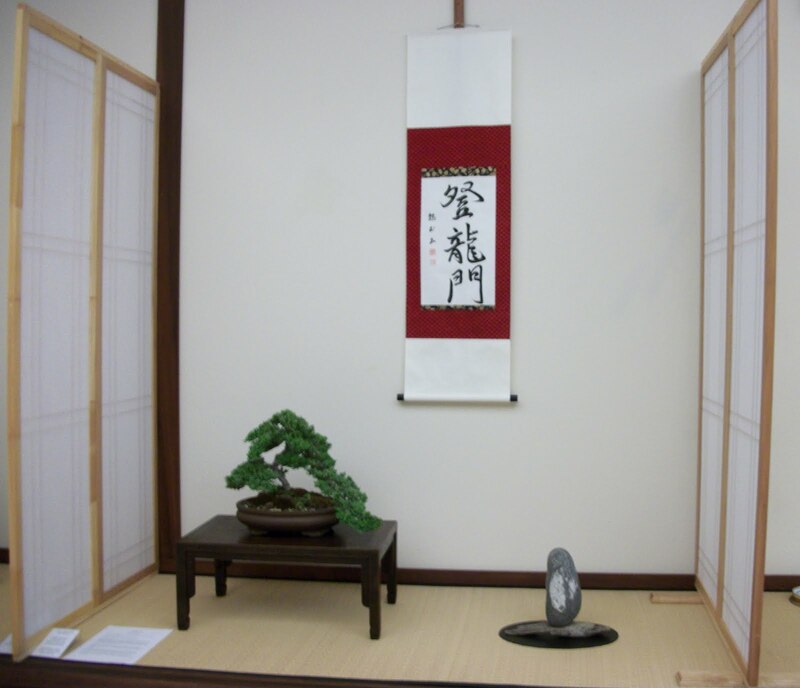 You can also see some display critiques from a Japanese Sensei at the following links. 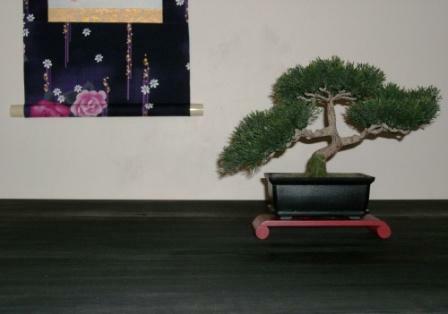 Before you bonsai artists get too overworked about how many rules I didn't follow in the Keidou school of display (which I have not studied and have no experience with), read the whole article and then make a judgement. The point of my display was to harmonize the three pieces and to have each piece represent something. But before you can read what the symbols mean you need to know the phrase meaning of Touryuumon (登龍門). There is no doubt that the phrase Touryuumon is the name of the difficult barrier that must be broken through or overcome in order to see success. More deeply, this phrase comes from the legend that fish, specifically 鯉 Koi, that can swim upstream past the waterfall called “三段の滝Sandan no Taki or Third Step” which is located on the middle section of the Yellow River in China will become a dragon, and this waterfall area is called the Touryuumon. It is this idea that one must overcome the worst of difficulties, in order to move on to a greater difficulty. Success and growth is only then accomplished. All human beings are faced with trials in life. However, in order to confront the greatest afflictions one must first have striven to overcome smaller obstacles, much like the fish faces on first swimming up the Yellow River, and then overcoming the waterfall. Only then will the fish become a dragon. Likewise, one will see great growth only after taking on the tasks of the first challenges. Additionally, no matter how diligently one strives to overcome the trial and become the best, there are times when these barriers just cannot be overcome. However, the effort expended was surely not a waste for the individual. Those mistakes will spring back in the form of success and pride at some time in the future. It can be said that a smooth life will not bring about success. Therefore, this phrase provides all interesting hope for personal struggles. Excerpt translated by Jonathan Maples from page 640 of the Zengo Kichigo Jiten (禅語吉語字典) published by the Japanese Calligraphy Society (日本書道協会　〒151-0053 東京都渋谷区代々木1-11-1). The suiseki chosen symbolizes the carp/Koi. The Koi is in a very neutral vertical position with the head down, and an eye to the left, with the typical wide-open mouth. While some of the form is ambiguous, with the body perhaps curving and hidden by grass, it actually is positive for the overall display design. The image recalls endless similar images found in Japanese paintings. The stone is graywacke, but the image carries well from a distance. The position of the rock presents the Koi in calmer waters, eyeing the falls and circling to gain courage before the ascent. 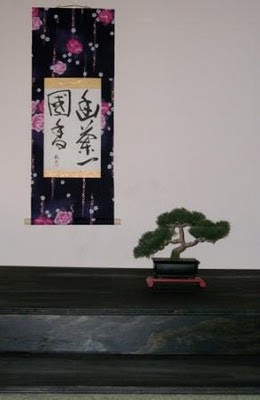 The cascading shape of the bonsai represents the 三段の滝 Sandan no Taki or Three Step waterfall in the middle section of the Yellow River in China. The fish must climb up the cascade to reach the apex. This tree is a Procumbens nana or Japanese Garden Juniper. The apex is 15” from the base of the pot or 12” from the base of the tree. Like the Sandan no Taki, the scroll will be made in a three step style called 三段表具Sandan Hyougu. This reinforces both the number of characters in the writing, references back to the name of the waterfall, and completes the three pieces within the three point display. This piece in the display will symbolize the transformation of the 鯉Koi into a 龍Ryuu Dragon. 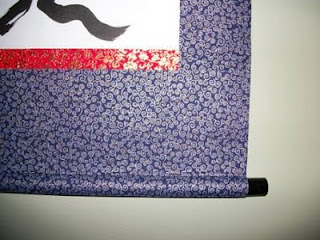 The Blue in the Ichimonji is used to provide a very strong transition between the cloth and 本紙 Honshi. The red cloth is used to stir up the visualization of the koi transforming into a dragon and adding the red color to the scales. The white of the Chi is representative of the mists of foam and water churning in the river’s waterfall. Lastly, the white of the Ten should suggest to the viewer the ascent of the dragon into the clouds. Transformation is now complete. 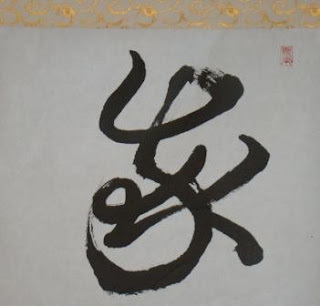 As an interesting side note, Touryuumon was written by my wife who is a 師範 Shihan rank 書家Shoka calligrapher, whose calligraphy name assigned to her by her Sensei is 龍玉 Ryuugyoku. Ryuugyoku means Dragon Egg. Scroll dimensions given in the traditional Japanese 分　Bun unit of measure which is roughly equal to 3.03 mm (Graph not Available on this blog). The total scroll length is 4 feet 5 inches and the width is 15 inches. This is the phrase I chose as the theme for my　床の間 Toko no Ma display, which will be exhibited at the Clark Center for Japanese Art and Culture. This museum is located in Hanford, California. More coming after the competition. I just got home from Vancouver and your box was waiting for me. It's fantastic! Perfect, even!! This scroll was made for fun...it is available for sale. Maybe the dragon never needs to use force. I will be at a karate tournament in New Mexico. Customers ask me to do new things which challenge the norm. This customer asked for an Aikidou scroll to which he could attach a picture of Osensei, of Aikidou, Morihei Ueshiba. This is not a traditional presentation of a kakemono, but it is still beautiful, and hope it provides the desired end result. This scroll is about 3.5 feet in length and 1 foot wide. The picture is a 4" x 6" print. The Aikidou is written by hand by Ryugyoku. The inkan still needs to be affixed. This scroll is our translation of a quote purported by the customer to originate from David Attenbourough, a famous naturalist and biologist of British television. This customer asked us to translate, “I Have Burning Questions” into Japanese. To accurately convey the message of this phrase my wife requested clarification on what type of questions were being talked about? I said something to the effect of the mysteries of the universe, and things we do not know yet. As a result, we translated the work to read 我心要問在, which is written in all characters which is a traditional method of presenting Japanese calligraphy. The customer requested this in Sousho, or grass style writing. The size of the characters and the spacing in relation to the scroll were well planned out and written by Ryugyoku. In order to make a good transition between the cloth and the writing, I chose an ichimonji (brocade) with a more open, less busy pattern, and used a lighter color than the cloth, but not a true white, so that it cascades from Darker Cloth, lighter ichimonji to white scroll. 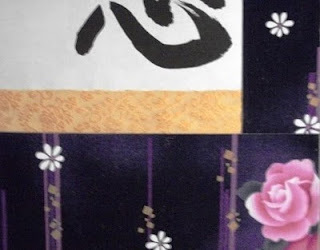 The effect is very basic and typical of many traditional Japanese Maru Hyougu style scrolls. This customer really has an eye for the end look of the scroll, in that in companionship to the beautiful wood lacquered jikusaki, they also ordered a black kakehimo and makihimo to complement the scroll. And pursuing the previous mentioned pattern from top to bottom goes darkest black kakehimo, dark tan cloth lighter ichimonji, white scroll, lighter ichimoji, dark tan cloth, darkest black jikusaki. It is a very labor intensive process to make a scroll this large, but the end results are very satisfying.